An autobiography by Samantha Jackel. Samantha’s visits and her book. Read the endorsements that Samantha has received from ministry partners and those who have been touched by her message around the world. Samantha never dreamed she would write a book – and certainly never thought she would speak healing into peoples lives around the world. Read a bit about Sam’s life here. 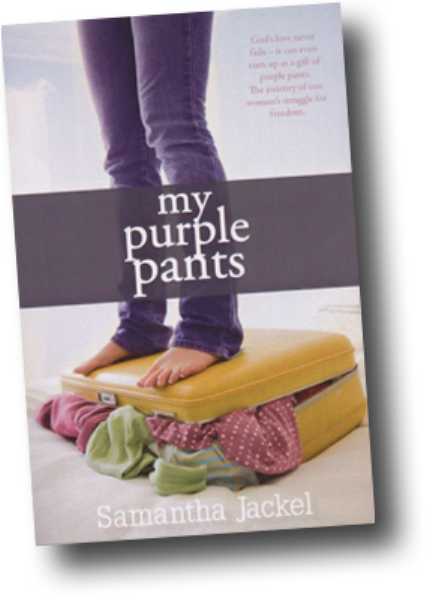 Samantha’s biographical book, My Purple Pants details a life that has known abuse, recovery and restoration. It reveals the God of bible is alive and well today – and that His gift of grace sometimes comes in the most unexpected ways. View a gallery of select pictures that chronicle Samantha’s life as well as pictures that detail some recent notable events and adventures.